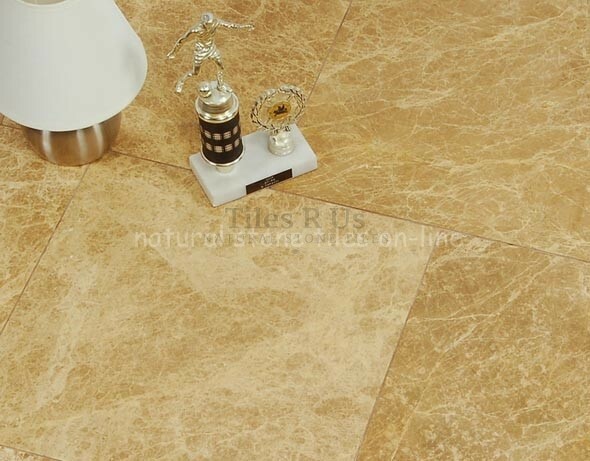 Price is per square metre of tiles (m2) Tile category: Marble Polished Product Information:- Emperador marble polished tiles have a pale yellow/beige background colour with distinctive cream veining and they now come in a polished finish - this is a new addition to our marble range. The background colour and distinctive cream veining never goes unnoticed by anyone that sees these tiles installed. A polished surface gives a beautiful glossy shine that is produced by the natural reflection of marble stone crystals. The mirror-like shine is accomplished by using progressively finer polishing heads during the polishing process, similar to the way that sandpaper smoothes hardwood furniture. It offers a very formal yet warm appearance. If you want a tile that will give you a classic and contemporary look - then these polished marble tiles are the answer to your home decor style!Click here to check our TILING ESSENTIALS range including tile sealer, tile cleaner, tile adhesive and tile grout; we only supply carefully selected Tiling Essentials for Tiles R Us. We recommend for this tile: Adhesive: Flexible standard set or fast set adhesives Grout: Flexible narrow joint grout or flexible wide joint grout Tile Sealer: MPG polished tile sealer Tile Cleaner: Grimex stone tile cleaner Tile Maintenance: WaxwashUnder Floor Heating: Click here to see all the details and options available in our Comfy-Toes UNDER FLOOR HEATING rangeWarm comfortable feet - absolute heaven in your kitchen, bathroom, shower room or conservatory! Don't miss the chance to check our low cost, high quality range of floor heating systems.